Shoestring 9/11: The F-16s That Failed to Protect Washington on 9/11: Was the Langley Jets' Emergency Response Sabotaged? Firstly, I examine the initial order to launch F-16s from Langley AFB. Notably, instead of the usual two jets taking off, a third pilot took off in a spare jet. This left the unit with no supervisor of flying (SOF) to communicate with other agencies and pass on vital information to the pilots. Secondly, I question why, instead of heading toward Washington as instructed, the jets initially flew out over the ocean, where they were of no use in defending against further attacks. I look at the mysterious role played by the Fleet Area Control and Surveillance Facility in Virginia Beach, which was handling the jets while they were over the ocean. Could this facility have been misdirecting them? Thirdly, I look at the breakdown of communications between the military and the Langley jets, and the confusion experienced by the pilots that this contributed to. Taken together, the sheer number of things that went wrong appears highly suspicious, and makes clear the urgent need for a new and unrestrained investigation of 9/11, to find out what was really going on that day and who was behind the attacks. It is important to recognize here that, despite the unprecedented nature of the 9/11 attacks, the task the F-16s were being asked to perform was a well-practiced and routine one. Even before September 11, NORAD regularly launched fighters in response to suspicious aircraft. It reportedly performed 67 such scrambles between September 2000 and June 2001. And a 1994 General Accounting Office report stated: "Overall, during the past four years, NORAD's alert fighters took off to intercept aircraft (referred to as scrambled) 1,518 times, or an average of 15 times per site per year. Of these incidents, the number of suspected drug smuggling aircraft averaged … less than 7 percent of all of the alert sites' total activity. The remaining activity generally involved visually inspecting unidentified aircraft and assisting aircraft in distress." So, over that period, NORAD launched fighters to intercept suspicious aircraft once per day on average. Yet on September 11, the performance of the NORAD jets launched from Langley AFB was disastrous. 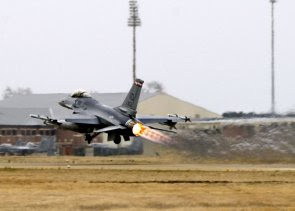 Then, at around 9:34 a.m., William Huckabone, a staff sergeant at NEADS, noticed that the F-16s were drastically off course, heading east out over the ocean instead of north toward the Baltimore area (see below for details). The jets urgently needed to be redirected onto their intended course. But, as Spencer described, Huckabone could not "get word to the jets through their SOF--he's flying!" Presumably there were other times when the absence of the SOF meant NEADS, and perhaps other agencies, were unable to quickly pass important information to the jets, but these incidents have not yet been reported. Furthermore, we do not know who at NEADS instructed Borgstrom to take off in the spare jet, thereby leaving his unit without its SOF. In an interview, Borgstrom later said, "to this day, I don't know who it was" that made the call. When Jeremy Powell had called from NEADS and learned that Borgstrom had taken off in a third jet, he exclaimed: "Three? I only scrambled two!" Whoever instructed Borgstrom to take off should be rigorously questioned about why they issued such an unprecedented--and dangerous--order. DID NAVY CONTROLLERS SEND THE JETS THE WRONG WAY? However, evidence shows that the question of why the jets went so drastically off course requires further investigation. For example, a Navy facility was responsible for handling the F-16s while they were out over the ocean. The Fleet Area Control and Surveillance Facility in Virginia Beach, Virginia, is the Navy air traffic control agency that handles all over-water military operations. It is known by the call sign "Giant Killer." When Nasypany asked Major James Fox--the leader of the NEADS weapons team--why the Langley jets had flown out over the ocean, Fox replied, "Giant Killer sent them out there." Certainly, what little has been reported about the actions of this facility appears quite bizarre and suspicious. Another indication that the Langley F-16s' ability to respond to the crisis was being sabotaged is that military personnel repeatedly experienced problems when trying to communicate with them. Lynn Spencer described three particular incidents in which NEADS was unable to contact the fighters, although presumably there were other occurrences of this problem. While Spencer's explanation--that the Langley jets were outside NEADS's radio range--may be correct, these communications problems should surely be investigated further, to check this. This is especially the case since, as tape recordings of the NEADS operations floor from September 11 have revealed, personnel there repeatedly complained about various communications problems that morning. For example, one member of staff at NEADS told an American Airlines employee, "We cannot call out for some reason." Later on, when a caller mentioned, "We're having a tough time getting hold of you guys," a NEADS employee responded, "We're having problems with our phone lines as well." During a 2004 interview, 9/11 Commission staffers mentioned to NEADS employee Chief Master Sgt. Edward Aires that "they had heard in past interviews that there were communication lapses and difficulties between NEADS and Langley scrambles." Might there have been deliberate attempts made to block communications to and from NEADS that morning? Could these jumbled communications have been part of a deliberate attempt at paralyzing the emergency response, by trying to prevent legitimate orders from reaching the pilots? We have seen that there were numerous ways in which the Langley jets were hindered on 9/11: the delay while they were on the runway and the problems that occurred because the alert unit's supervisor of flying took off in a spare fighter; the fact that the F-16s flew east over the ocean, instead of going north as NEADS had instructed; the inexplicable indifference of the Navy controllers who were handling the jets while they were over the ocean; NEADS's repeated inability to contact the pilots directly; the jumbled communications the pilots were receiving over their radios; and the fact that the pilots were not informed about what was going on or what their exact mission was. There is evidence of additional problems that further impeded the Langley F-16s that morning. Lynn Spencer described two notable incidents. These incidents are only what have been described in the publicly-available accounts. It seems reasonable to assume the jets experienced other complications that have so far gone unreported. A thorough and unrestrained investigation of the 9/11 attacks is imperative in order to reveal such problems, find out why the Langley F-16s were so badly obstructed in carrying out what should have been a routine emergency response, and uncover who was responsible for this. Parsons Engineering Science, Inc., Draft: Work Plan for a Treatability Study in Support of the Intrinsic Remediation (Natural Attenuation) Option at IRP Site - 16. San Antonio, TX: Air Force Center for Environmental Excellence, June 1995, p. 1-3; Jonathan Weisman, "Shoot-Down Order Issued on Morning of Chaos." USA Today, September 16, 2001. Parsons Engineering Science, Inc., Draft: Work Plan for a Treatability Study in Support of the Intrinsic Remediation (Natural Attenuation) Option at IRP Site - 16, p. 1-3; "Langley AFB, Virginia." GlobalSecurity.org, January 21, 2006; Lynn Spencer, Touching History: The Untold Story of the Drama That Unfolded in the Skies Over America on 9/11. New York: Free Press, 2008, p. 114. 9/11 Commission, The 9/11 Commission Report: Final Report of the National Commission on Terrorist Attacks Upon the United States (Authorized Edition). New York: W. W. Norton & Company, 2004, p. 17; Lynn Spencer, Touching History, p. 114. Lynn Spencer, Touching History, p. 117. 9/11 Commission, The 9/11 Commission Report, p. 27. Dan Collins, "Scrambling to Prevent Another 9/11." Associated Press, August 14, 2002. Jerry Herley et al., Continental Air Defense: A Dedicated Force is no Longer Needed. Washington, DC: United States General Accounting Office, May 3, 1994, p. 4. Leslie Filson, Air War Over America: Sept. 11 Alters Face of Air Defense Mission. Tyndall Air Force Base, FL: 1st Air Force, 2003, p. 63. Lynn Spencer, Touching History, p. 143. Ibid. p. 465; Lynn Spencer, Touching History, pp. 141-143. Lynn Spencer, Touching History, pp. 116, 118. Ann Scott Tyson, "A New Diligence in the American Blue Yonder." Christian Science Monitor, April 16, 2002; Lynn Spencer, Touching History, p. 118. Lynn Spencer, Touching History, p. 119. Craig Borgstrom, interview by Leslie Filson, circa 2002. Lynn Spencer, Touching History, p. 148. "Memorandum for the Record: Interview With NEADS Alpha Flight Mission Crew Commander (MCC), Lt. Col. Kevin J. Nasypany." 9/11 Commission, January 22-23, 2004; 9/11 Commission, The 9/11 Commission Report, p. 27. Michael Bronner, "9/11 Live: The NORAD Tapes." Vanity Fair, August 2006; Lynn Spencer, Touching History, p. 149. Ibid. ; Staff Report: The Four Flights. 9/11 Commission, August 26, 2004, p. 96. Matthew L. Wald, "Military Air Controller is Criticized in Close Encounter." New York Times, February 10, 1997; Lynn Spencer, Touching History, p. 143. Lynn Spencer, Touching History, p. 151. Michael Bronner, "9/11 Live"; Lynn Spencer, Touching History, pp. 149-150. Lynn Spencer, Touching History, pp. 150-151. 9/11 Commission, The 9/11 Commission Report, p. 27; Lynn Spencer, Touching History, p. 151. "(10:40 a.m.) September 11, 2001: First Fighter Seen Arriving Over the Pentagon." Complete 9/11 Timeline. Patrick Creed and Rick Newman, Firefight: Inside the Battle to Save the Pentagon on 9/11. New York: Presidio Press, 2008, p. 130. David E. Sanger and Don Van Natta Jr., "In Four Days, a National Crisis Changes Bush's Presidency." New York Times, September 16, 2001. Patrick Creed and Rick Newman, Firefight, p. 131. Lynn Spencer, Touching History, pp. 149-150. "(9:12 a.m.-11:57 a.m.) September 11, 2001: NEADS and NORAD Experiencing Communications Problems." Complete 9/11 Timeline. "Memorandum for the Record: Interview With Bill Aires." 9/11 Commission, January 23, 2004. Jere Longman, Among the Heroes: United Flight 93 and the Passengers and Crew Who Fought Back. New York: HarperCollins, 2002, p. 76. Kevin Sack, "2 Pilots Praise Passengers Who Fought Hijackers." New York Times, November 15, 2001. Leslie Filson, Air War Over America, p. 66. 9/11 Commission, The 9/11 Commission Report, p. 45. Jere Longman, Among the Heroes, p. 222. Ann Scott Tyson, "A New Diligence in the American Blue Yonder." Leslie Filson, Air War Over America, p. 65. Craig Borgstrom, interview by Leslie Filson. Lynn Spencer, Touching History, p. 182. Kevin Sack, "2 Pilots Praise Passengers Who Fought Hijackers." Lynn Spencer, Touching History, pp. 180-181. It is honestly hard to say if it was an intentional act of sabotage. When you hear the tapes, it is like some if them thought it was a joke and/or they had no training on what to do, "who do we call? How do I get 'somebody' to scramble jets?" The other issue is that at least until 2001, military air response training was that threats usually come from the ocean, not from 'within,' so in the heat of things, directors at GK may have assumed that initially. Not sure if we'll ever know. It is difficult to say the actual reasons behind the problems that day. A lot of the people in the tapes seemed to have no training, both civilian ATCs and also lower levels at the military defense networks. There is a lot of, "wait, what? Who do I call? Who is it that scrambles fighters for this, DO we scramble them for this?" From there, base military air defense within the nation center on threats coming from outside as in from the ocean. So who knows, one person in high command at GK may instinctively fallen back on that traning in time of crisis and mistakenly sent the Langley jets the wrong way. Who knows, if sabotage came from within, you can bet each actor only knows their own part in it so as not to have credibility. thank you for your research. fantastic job!